I am no dancer but when Tiesto starts laying down his beats, my hips take on a life of their own. He has an intuitive way with music that allows my inner dancing diva to shine. Just listening to some of his hits on YoutTube like “Beautiful World”, “Sweet Things”, “Elements of Life”, “I Will Be Here”, “Silence”, “Work Hard Play Hard” and “We Own the Night" make me want to close my eyes, jump around and pump my fists in the air. It is for this reason, among many others, that Tiesto was the first DJ to ever be allowed to play at the opening ceremonies of an Olympic event in Athens, Greece. He is also the first to rank #1 in the Top 100 DJs list by DJ Magazine for 3 consecutive years and was hailed as the 40th Greatest Dutch Citizen of All Time and Officer of the Order of Orange – Nassau by the Dutch Royalty in 2003; and International Dance4Life Ambassador in 2006. 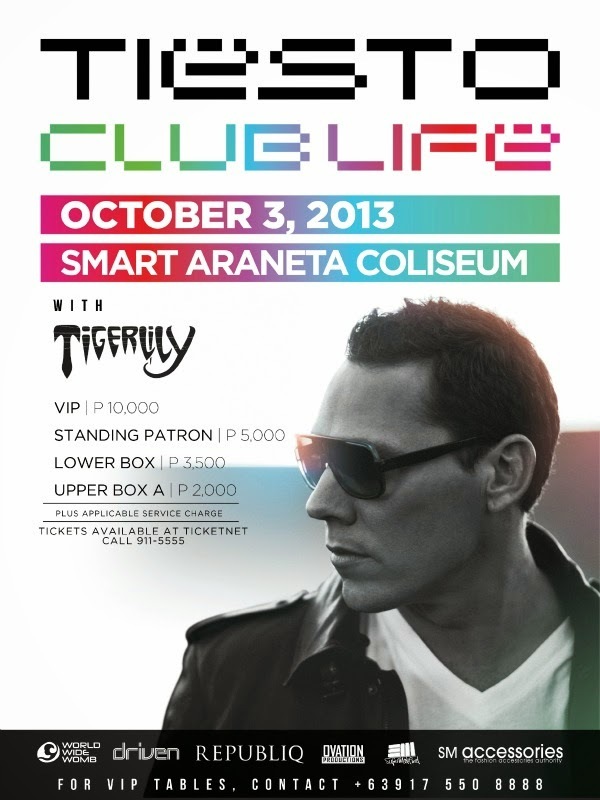 The list is long but for now, let's just focus on the music and a chance to party at one of 2013's hottest dance events! In cooperation with SM Accessories, I'm giving away 2 upperbox tickets to 1 lucky Fashion Eggplant reader! To enter, just fill up the Rafflecopter form below, but hurry, this contest will only run for 2 days! Good Luck! thank you for this contest! Hoping to win! Wanna win this, go with a bestie and have fun!